From the Cadets' Web site: Cadets' arranger Bocook inspired at camp; Corps plays nearly nine minutes of show Jay Bocook didn't expect what he heard Sunday morning at Penns Grove High School in Carneys Point, N.J. 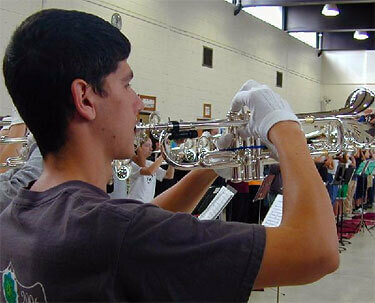 The Cadets' arranger of 15 years knows this corps always plays with passion and proficiency, no matter the time of year. But in mid-January and only two camps with his arrangement of "Symphonic Movement" under their belts, Bocook was seized by the Cadets' bold and assured sound. "I'm overwhelmed at the enthusiasm and confidence they have with this opening production," Bocook said. "It's so much more powerful than I ever imagined it would be." The 70-plus brass players that filled the high school cafeteria were almost too much for the ears, Bocook admits, and when they get outside onto a field, the possibilities are vast and exciting. "That last time they played through it, it was almost physically painful ... it was so powerful," Bocook said. "They are inspiring with the confidence level they are showing and they appear to be so comfortable with this piece." Nearly 100 brass players and percussionists attended the Cadets' fourth camp of the 2007 season, bringing with them a desire to make an impact, learn and grow and charge ahead with their return to tradition program, "This I Believe." By camp's end, ensemble rehearsal drew an enthusiastic crowd of family and staunch supporters, jubilant to hear both percussion and brass playing with such fervor, control and authority. Read more on www.yea.org.